This dress is pretty. At first I was very skeptical about what would it look like when I finally have the item in the mail. Because it happened to me many times, that the photo online and the physical picture of the product is way too different. I am happy to see that what you’ve seen in the photo online it is what you actually received. I am impressed and now I don’t return the product because I am satisfied with what I get. I picked X-Large because it’s the only available size they have for the design and the color purple floral that I want. It first just right, but a little bit big, one thing I like so my body can breath. The fabric is high quality, it is not thin but instead soft and you need to iron it because of the kind of the fabric it is. I did and no more wrinkles after I washed it. I like the vivid roses and the color of the flowers and design. The zipper on the back is invisible, easy to zip and unzip. I did not experience any trouble at all. The sewing is properly done too, I did not see any thread hanging. I feel very comfortable while wearing the dress last Father’s Day. For the price of Price: $19.99, I picked X-Large because it is the only size they are available for the design and Color: Purple Floral I like. 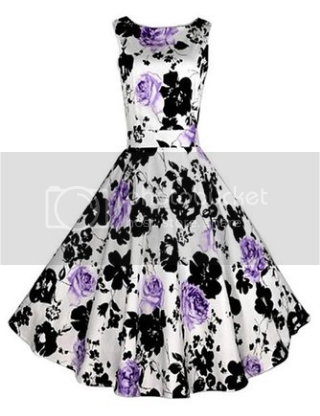 Choies Women's Garden Floral Tie Waist Sleeveless Skater Dress can be purchased throught Amazon.com. I love the colors, probably because black and purple are two of my most favorite ones. It's the perfect dress for the summer as well. Awesome choice!